Out now is a game that is sure to have all Windows & Windows Phone 8 gamers everywhere talking! (trust me). 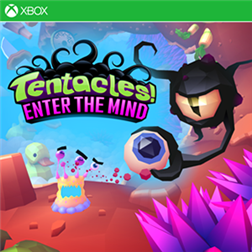 Tentacles: Enter the Mind, a new puzzler/action Xbox enabled game has just officially launched and has been made available for both platforms exclusively and Free-to-play. Check out just what the game will offer below and head past the video break to download. Dr. Phluff’s failed attempts to create ultra-cute animals have driven him mad! Only you, the adorable, tentacled Lemmy, can save him. Following the guidance of Dr. Phluff’s well-meaning subconscious, tap or click to navigate through the layers of the doctor’s outrageously bizarre mind. Gobble enemies’ eyeballs, collect secret eggs, and gain new powers and abilities. And when you reach the depths of Dr. Phluff’s mind, survive as long as you can! NOTE: Tentacles: Enter the Mind is free to play, but has optional in-game purchases. In-app purchases can be disabled through your device settings. Written by: MBGW on August 20, 2014.